Suzan "Suzi" LeVine was sworn in as the United States Ambassador to Switzerland and Liechtenstein on May 30, 2014. She took up her position in Bern on June 2, 2014. LeVine took her oath of office while placing a hand on a Kindle and thereby became the first U.S. official to be sworn in on an e-reader. She resigned her post in Bern on January 20, 2017. Suzi’s diverse and non-linear career focusing on education, technology, community, innovation, travel, social responsibility, and youth outreach was good training for her role as Ambassador. In a professional capacity, Suzi worked at Microsoft as a Director and at Expedia as a Vice President. Twice during her career, she was a stay-at-home mom, during which time she co-founded two non-profit organizations – an innovative Jewish community model, The Kavana Cooperative, and an advisory board for an early learning research institute at the University of Washington, ILABS – the Institute for Learning and Brain Sciences. Suzi is a graduate of Brown University with a Bachelor of Arts in English and a Bachelor of Science in mechanical engineering with aerospace applications. She and her husband have two children, with whom they enjoy hiking, biking, traveling and playing with their dog. Eric A. LeVine is an entrepreneur based in Seattle. He has been the founder and CEO of CellarTracker since 2003. Eric spent most of his early career at Microsoft, moving from marketing to product planning and program management. In 2005, he formally retired from Microsoft to follow his entrepreneurial vision to create a software solution for wine enthusiasts. He has also been a Council Member at the United States Holocaust Memorial Museum since September, 2016. Eric grew up outside of Boston, Massachusetts. He attended Harvard College and received a degree in History in 1991. CellarTracker has grown to become the leading cellar management tool with hundreds of thousands of collectors tracking more than 60 million bottles. Since 2014, Eric has served alongside his wife, representing the U.S. in Switzerland and Liechtenstein. His days continue to be filled with the attention to his business venture, ongoing philanthropic work and caring for the couple’s two children. Our guest speakers are Suzi and Eric LeVine. Suzi, appointed by President Obama was the most recent Ambassador to Switzerland and Lichtenstein. While representing the U.S., both Suzi and Eric worked closely with local Swiss government officials and the business community to learn about Switzerland’s top-rated apprenticeship program. They are currently going around the U.S. to talk about what they learned and share ideas on how to boost employment. At more than $80,000, Switzerland’s per capita income is the 3rd highest in Europe and the 4th highest in the world. Switzerland is home to one of the world’s most innovative economies and its unemployment rate rests comfortably below 4 percent. All of this in a nation that produces comparatively few university graduates. In an era marked by increasing competition, automation, and globalization, what is the secret to Switzerland’s success? According to a new report from researchers at the Center on International Education Benchmarking (CIEB) of the U.S.-based National Center on Education and the Economy (NCEE), Switzerland’s vocational education and training (VET) system, one of the strongest in the world, is a very important contributor to that country’s economic success. While representing the United States and based in Switzerland, the LeVines learned first-hand the benefits of this system and how it could benefit workers throughout the U.S. They’ll deliver remarks about their work as self-described “evangelists of apprenticeship”. Suzi and Eric are convinced that there are many pathways to success, and that an “Apprenticeship Renaissance,” as they call it, is a key to the long-term economic growth in the United States and a key to more people than ever achieving their American Dream. 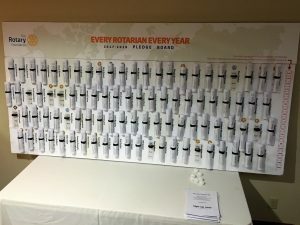 It was good to see our members already rally to the EREY cause in November and a huge shout out to Scott Sadler and his team for their dedication in helping us reach for this goal. We are only a few short of hitting the 100% mark. I hope that the remaining few, who have not committed to supporting the foundation, will be able to make their contribution and help us cross the finish line for EREY. Our Turkey Drive was hugely successful and we were able to secure a cash surplus of $6,250 thanks to everyone’s generosity. In particular, I would like to further recognize Alan Bohling, Tom Leonidas, Steven Goldfarb, Matt Dijulio and Morris Kremen for their donations. We will use some of the funds to honor Michel Carter’s memory within RFH and being awarded the Mike Shanahan Award for his contributions to RFH. We had a great shout out from Chris Boland this past Friday to help fulfill a seasonal miracle for a member of community who can benefit from our help – a great opportunity for fellowship, doing good and getting our hands dirty as we help an elderly member of community tidy up his yard! Please reach out to Chris, Ann Norman or me if you are willing to get involved. Our Eastside Rotaracts are taking on the cause of helping the homeless by securing clean socks and they have asked us to help. This is a wonderful way for us to lend our support to a wonderful group of people that take pride in being sponsored by our club. I hope that each of our members can buy a pair or two of socks to help them in their drive with this community project. It is worth noting that clean socks are the most asked for item from the homeless support groups and reminds us that it is the simplest things that can make a difference for those who are challenged in our community. I hope that you will all support the call from Carmela to support our Family Party on December 15th – it is an opportunity for our club members to bring their family into the spirit of fellowship that underpins our club’s success. It is also a wonderful way for us to say thank you for their support of our Rotary commitments. Also, let’s not forget the Black & White Party to be hosted at the Loft in Washington Square – let’s kick off the New Year with a strong showing of fellowship and celebration. I want to leave the best to last – our Apple Cup Tom Foolery, where we had a couple of miracles in one day! 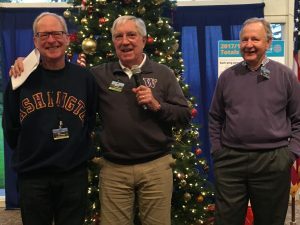 First, Kim Shrader was indeed seen in a husky sweatshirt, after losing his Apple Cup bet to Dennis Newell and Bob Holert – a miracle to behold for sure! However, Kim’s reluctance to sing the Husky fight song was followed up by our second miracle of Dennis and Bob leading the Cougar fight song with our Cougs in attendance – this was a seasonal miracle wrapped up in the 4-way test as a gift that BUILT GOODWILL and BETTER FRIENDSHIPS within our club! I look forward to sharing the rest of this month with you all as we rush headlong into the final month of 2017 and reflect on the good that we are doing through our work with Rotary and its mission. Let’s close the skills-gap here in the United States. Literally, millions of jobs sit vacant because there’s little infrastructure in-place to provide training and a vocational education for well-paying jobs. The per capita income in Switzerland is approx. $80K. In the United States, approx. $60K. 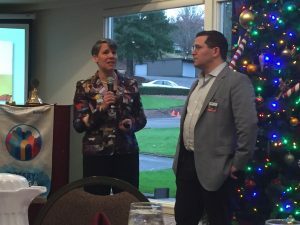 So very honored to have Suzi and Eric LeVine join us today at the Bellevue Breakfast Rotary Club. Their presentation on how the United States should replicate the Swiss Vocational Education and Training System was spot-on. Such a program is desperately needed here in the United States. 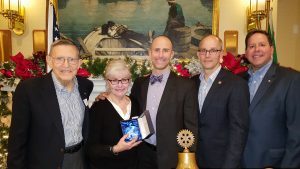 Today, the University District Club hosted Rotary First Harvest’s 2017 Shanahan Awards. This year 3 awards were given. The first was presented to Kris and Erick Ringsrud. The Ringsruds have an apple orchard in Cashmere and have generously donated thousands of pounds of apples to RFH. The second award was presented to Ed Taylor of Taylor Driving School. TDS has been crisscrossing the state, hauling over 250,000 lbs. of produce. The third award was presented to the Carter Family in memory of Michel Carter. There was a tribute video (CLICK HERE) presented then Adam Mihlstin and Howard Johnson provided comments about Michel, BBRC, Rotary and RFH. Rachel and Brian Carter were in attendance to receive the Shanahan Award – a beautiful crystal apple etched with Michel’s name and a fitting tribute to his many contributions to RFH. OFFSITE Anniversary PARTY January 6th! Our first “MEETING” of 2018 is an OFFSITE Anniversary PARTY!! 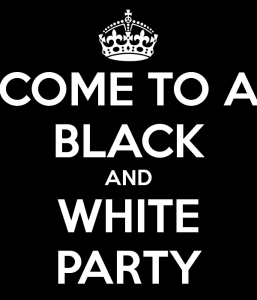 Join us for a “Black and White” Anniversary Party! An Elegant Evening (that means put on your fancy clothes people!!) of wine, appetizers, and good old fashioned BBRC Fellowship Fun. WHY: We can’t have a regular BBRC meeting at Glendale that week, and an Anniversary Party sounded much more fun! 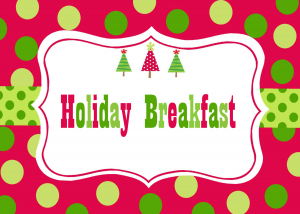 Our Annual Holiday Breakfast – and LAST MEETING of 2017 – is Friday, December 15th. There is NO extra ticket CHARGE this year – YAY!!! But PLEASE REGISTER by DECEMBER 8th so we can get head counts to catering!! 2017 Turkey Drive - Thankfully Successful! The 2017 Turkey Drive is complete. Funds raised by the Club purchased 60 frozen turkeys that were donated to Hopelink, Issaquah Food & Clothing Bank and the Snoqualmie Valley Food Bank. Thank you to ALL who donated. Lead donors for this effort included, Alan Bohling, Tom Leonidas, Steven Goldfarb, Matt DiJulio and Morris Kremen. We have a cash surplus of approximately $6,250 from the fund raising for this project. We’ll donate this amount to Rotary First Harvest in memory of Michel Carter. Michel was one of our most active members with RFH. Have a great Thanksgiving and an even better holiday season!